DO YOU USE TELE LENSES FOR LANDSCAPE PHOTOGRAPHY? When most people think about landscape photography, they often think Wide. Using Wide angle lenses is very common and for a good reason. Wide lenses have some great advantages for landscape photography. They capture a wide view of the scene, they provide great depth of field, and they create a deep perspective which emphasize the foregound and minimize the background. But in many cases they’re not always the right choice, and you shouldn’t fixate on shooting wide every time you see a great landscape. 1. the immediate foreground close to you is not always interesting, and doesn’t have to be included in every shot. Some times you only want a more distant part of the scene. 2. Landscape is not always about huge and wide scene, it can also be more intimate and include a small part of a scene like part of a water stream or mountain edge. 3. A TELE lens does exactly the oppsoite of a wide lens in terms of perspective – TELE lenses compress foreground and background and allow you to capture and emphasize both of them. 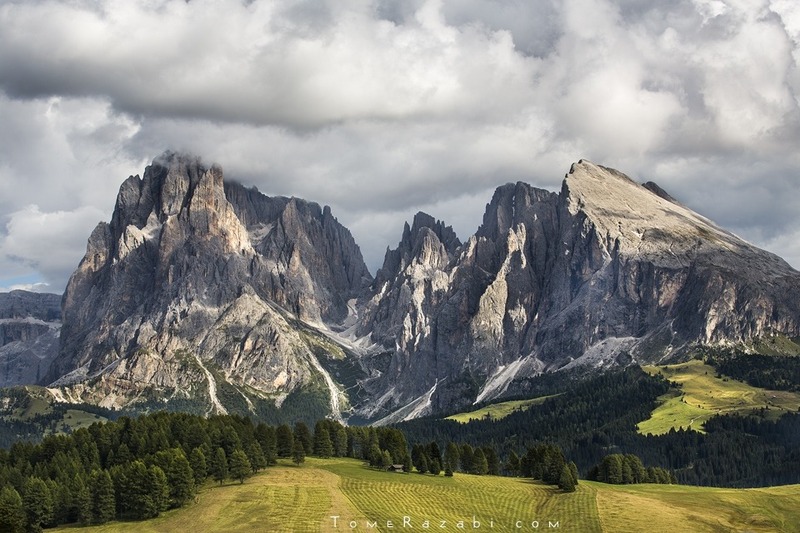 In this photo I was standing at the green hills of “Alpe di Siusi” at the Italian Dolomites, quite far from the “Sassolungo-Langkofel” mountain. Using a 70mm lens I was able to capture The green hill next to the mountain, the mountain itself, and the blanket of clouds wrapping it from above. With a wide lens I would get much more of the green hills, and the mountian would have been much smaller. 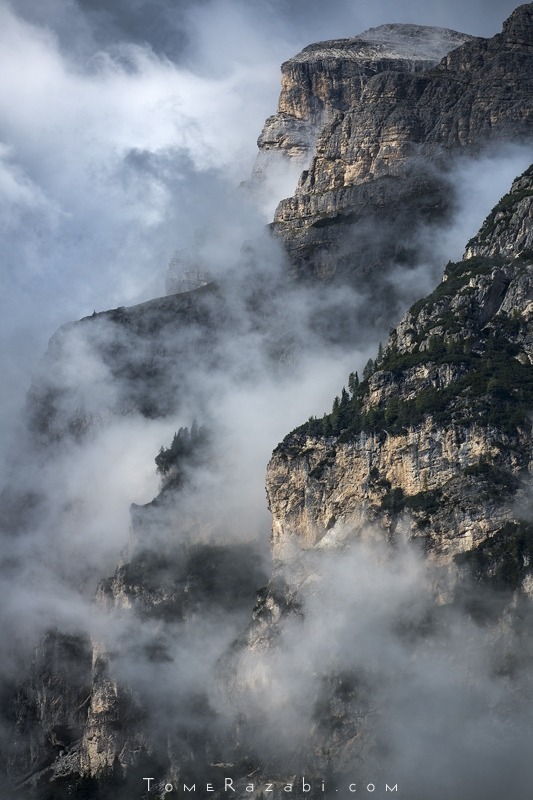 In this photo, at the viewpoint of Marmolada mountain (Dolomites), there was fantastic scene of clouds hovering above several distant ridges and valleys. The immediate forground was not interseting and I also wanted to emphasize all the different layers of mountains and valleys which were far apart of each other, and I achieved so by using a focal length of 100mm. 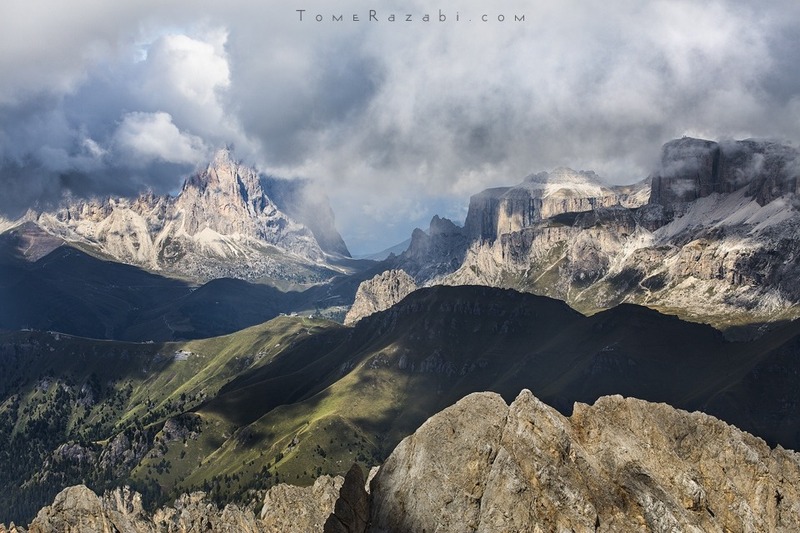 This frame was taken completely unplanned from a place I was parking (again at the Dolomites). I just raised up my lens and used a focal length of 180mm to isolte this fantastic intimate scene of clouds walking between the mountain edge. Here is another example of the photo at the top of the post which also captures another intimate scene, this time of the woodlands at Ngorngoro forest (Tanzania) with early sunrise mist. This one is a panorama of each single frame at 400mm. So next time you go to beautiful landscape, consider taking your TELE lens with you, or taking it out of the bag and see the great frames you can do with it. Try looking at smaller parts of a scene which are attractive and isolate them. Try to think if there scene you’re looking at is better at wide or at TELE for your foreground and background. Getting a good landscape composition with a TELE lens can sometimes be challenging. I always search for good landscape photos I like from other photographers and get inspiration from them. It might be hard for you to get good results in the begining, but if you try again and again you’ll see its worth it.